A refreshing, saline breeze, sand between your toes, cool salt water – you’re probably thinking of your favorite beach. But believe it or not, this could be your own backyard! Bring the ocean experience to you with a salt water pool from VistaPro Pools & Spas, a premier Maryland landscape and design company. At VistaPro Pools & Spas, we’re experts in building and designing zero entry pools for Maryland homeowners. We’ll make your tropical vision a reality by building a beach entry pool that your entire family will love. A beach entry, also known as a “zero entry” pool, slopes gently to allow for a more natural look and feel. 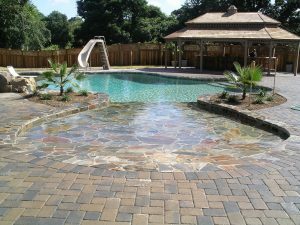 We can landscape your salt water beach entry pool with tile, sand, plants or any other feature that complements your unique style and vision. We’ll be there every step of the way, from designing to building your salt water pool. Our expert pool designers & builders will construct a safe, attractive and long-lasting pool for your family, complete with beautiful stone masonry and brickwork, custom patio construction and one-of-a-kind design elements. We’re confident we can build an ocean lagoon you’ll love. Check out our gallery of past projects to see some of the salt water pools we’ve designed and built for Maryland homeowners. At VistaPro Pools & Spas, we’re committed to building a salt water pool that matches your lifestyle needs, budget and desired look. Give us a call today at 301-805-0119 to schedule your free consultation!